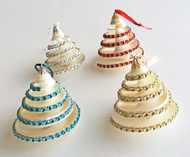 I love this time of year for many reasons, not the least of which is that it’s time for the (6th) annual coastal Christmas ornaments post. 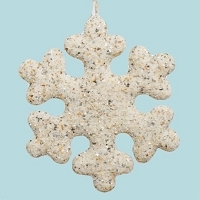 This year, I’ve only purchased…one coastal Christmas ornament. Basically, I’ve decided to lay off the whole “I’m just buying these for the blog” excuse while I inhale ornaments at an alarming rate. While this should speak to my character, it speaks instead to my thought that refraining this year will justify doubling my ornament purchasing next year. So I’ll start with the one I have and then continue on with the ornaments I’ve found online (in preparation for my buying binge next year). Earlier this year, Baby-Girl and I went on a field trip to Magnolia Plantation. After telling her we were not buying anything at the gift shop, I smeared the egg all over my own face by retracting my initial statement when I saw this ornament and remembered my blogging obligations. 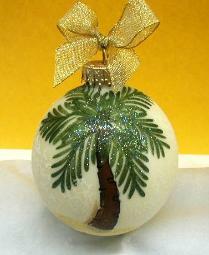 This is probably the other reason why I withheld from purchasing additional beach-themed ornaments this year; look at where I was headed? 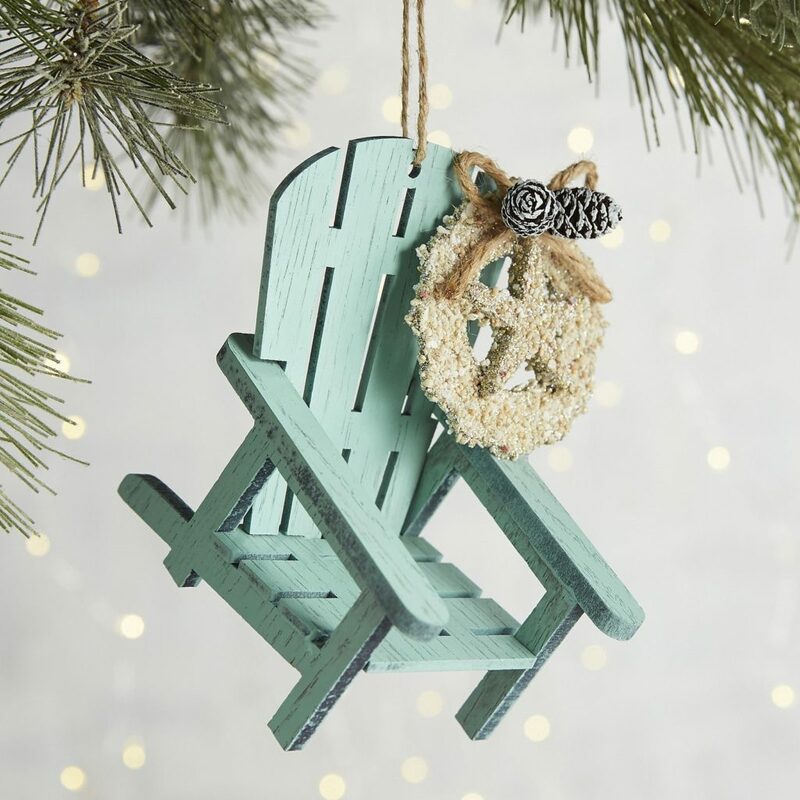 When I grow up, I’m going to visit every craft store on the coast and then hunker down with Completely Coastal, one of my favorite sites with lots of DIY ornament ideas. If you’re so inclined, start here. I’ve found two other ornaments that are significant because of their origins. This first one hails from North Carolina. I just love the idea of these. 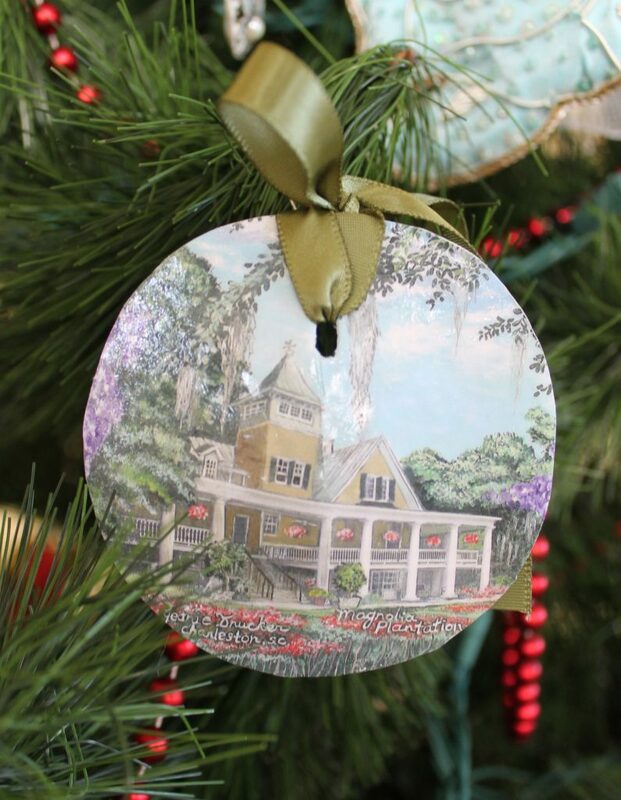 Sold by Our State, a North Carolina magazine, these ornaments are made from the sand of one of four North Carolina beach areas (your choice): the Outer Banks, the Crystal Coast, the Wilmington Area, and the Brunswick Islands. The place where these are made just speaks to me; they’re hand-painted in St. Thomas, one of my bucket list Caribbean islands. They can be shipped directly to you from Diane Artware, so I’m picturing opening the box and inhaling a burst of that sweet Caribbean air alongside the ornament. 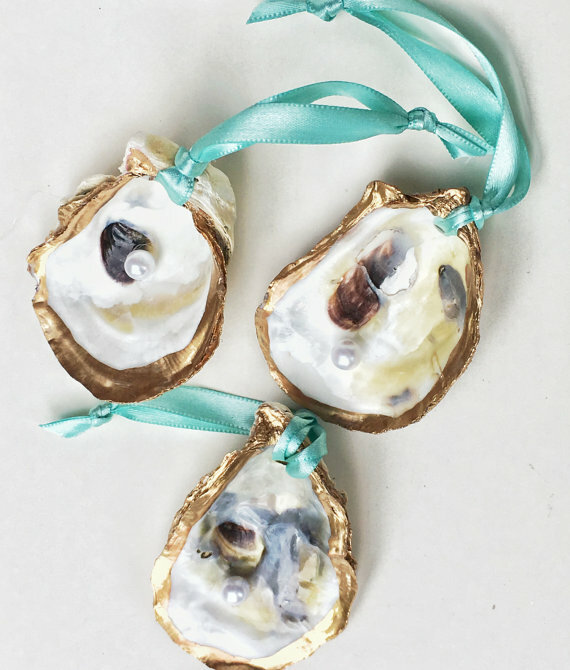 These oyster shell ornaments with gold edges and aqua ribbon from CoastalCornucopia come in sets of three. 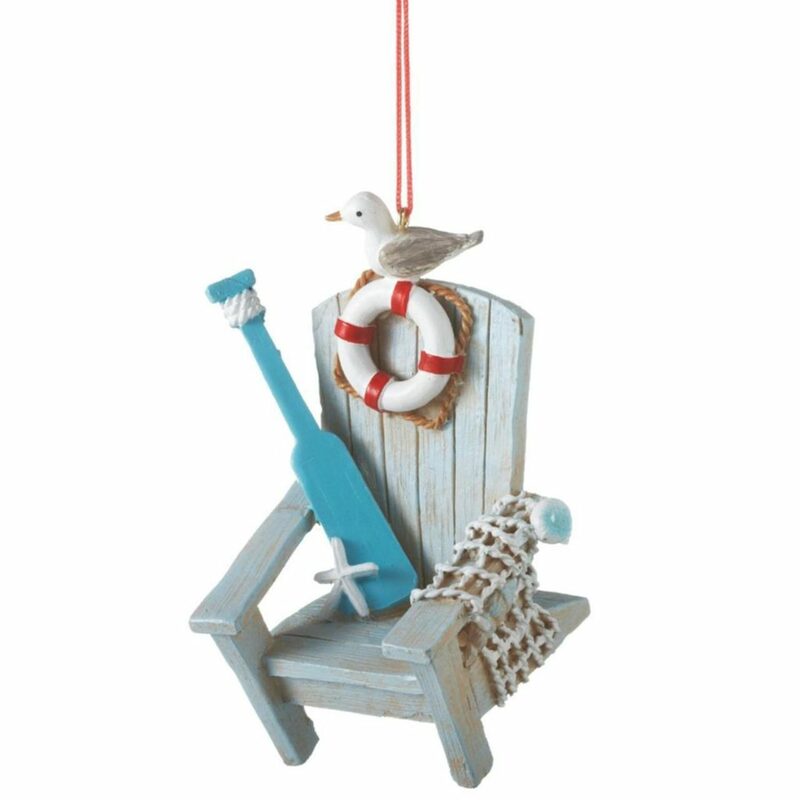 This Pier 1 Imports Adirondack beach chair ornament is a classic choice. Christmas Central also has one with more embellishments. 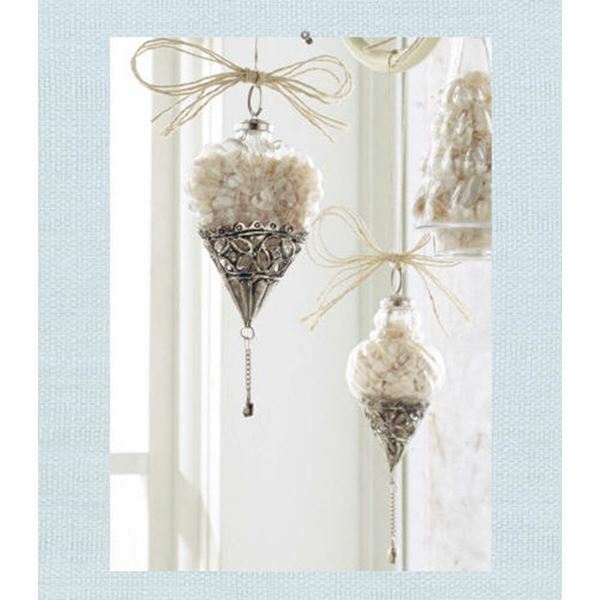 I love the vintage look of these ornaments from Seaside Inspired. 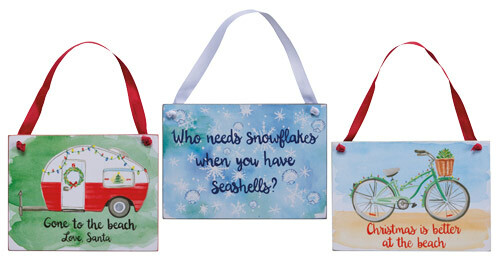 If you like a pop of color on your tree, check out these beach signs from Ocean Styles. nor with a sea glass sand dollar ornament, both from Caron’s Beach House. 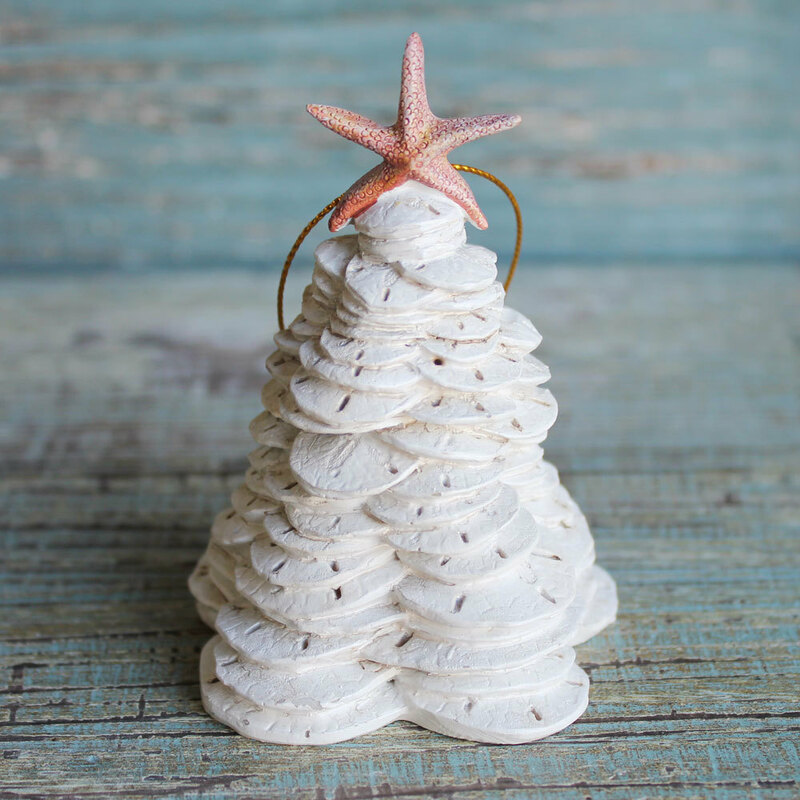 Why limit yourself to one sand dollar ornament, when you can have a sand dollar Christmas tree ornament from the aptly named caseashells.com? 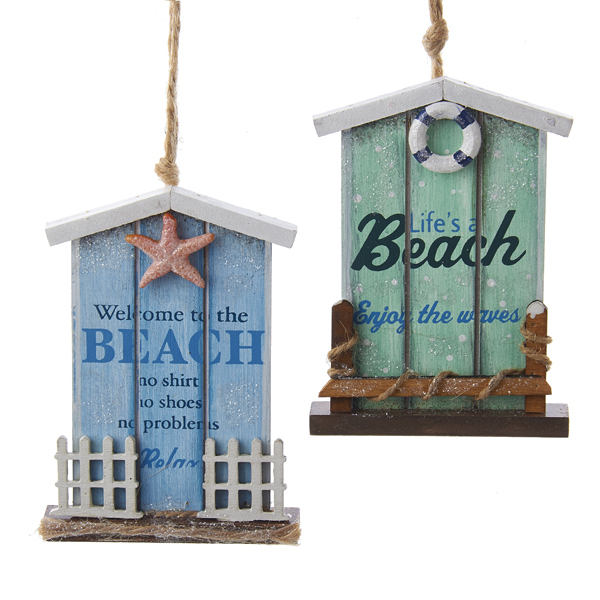 Christmas Mouse has a couple of beach cottage sign ornaments. I’d buy one of each if it weren’t for the aforementioned hiatus on ornament purchases. And whether your tree is Coastal Living cover material or whether Charlie Brown’s original tree puts yours to shame, I wish all of you all of the blessing of this joyous season.